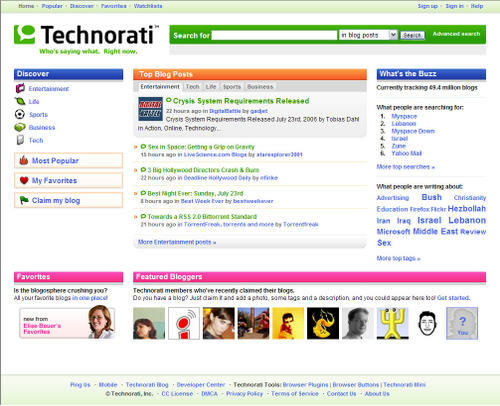 Technorati, the popular blog search engine, has turned three today and has launched a new homepage design. Technorati is more than just a blog search engine it is a "live web search engine" and offers a number of different features that make it a destination more than just a search search engine. It has positioned itself to look similar to the Yahoo! homepage which makes me wonder how long it will be before someone acquires them as I have mentioned before. Technorati is 3 years old! What an amazing trip so far. The World Live Web is all about people - We're here to help make sense of all the interesting stuff we do in real-time. Technorati's rolled out a major update to our site and to our back-end systems. We've made some major speed and accuracy improvements in core search. Link counting is a lot more accurate and timely. We've personalized the homepage so you can get a look at all the stuff you care about on one page. While we love expert bloggers, we've also spent a lot of time making Technorati understandable to normal people. We've added in lots of features to help you make sense of the blogosphere, including Discover, which is topic-based, Favorites, which gives YOU the power to pick your favorite blogs, and Popular, which algorithmically derives the most linked-to items in the last few days. We've made some big changes to blog profiles - allowing you to get stats about any blog that Technorati tracks, including the tags used, posting frequency, traffic, and Technorati ranking. We've made things easier for advertisers and partners, and we've been overwhelmed with demand. We're building out our capabilities, and if you're interested in advertising, drop us a line. This is just a start - there's more to come in the coming weeks and months, including better charts, more real-time spam detection and elimination, more real-time media indexing, microformats integration, and additional localization and language support. The update looks great. 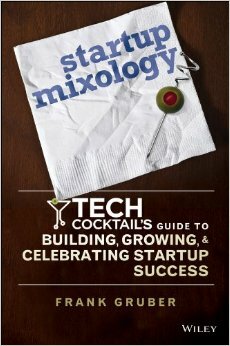 Happy birthday Technorati!